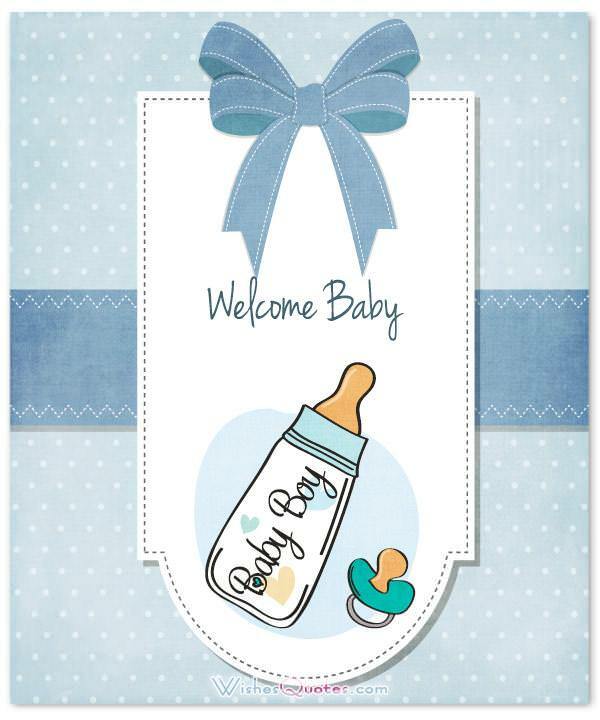 Congratulations for Baby Boy: Now it is time for you to take ideas from these wishes and plan the best way to wish your near and dear new born baby boys. The birth of a child is always a very happy moment. It is the moment to pray for the baby for a prosperous life, it is the moment to wish congratulations to the proud parents who have given birth to the baby and it is the most perfect time to send wishes for the new born baby. If the child is a boy, then you must consider him to be the hero of the future; the one who will have the power to rule the world. So, to show your love to the new born child you must think of some awesome creative ideas. 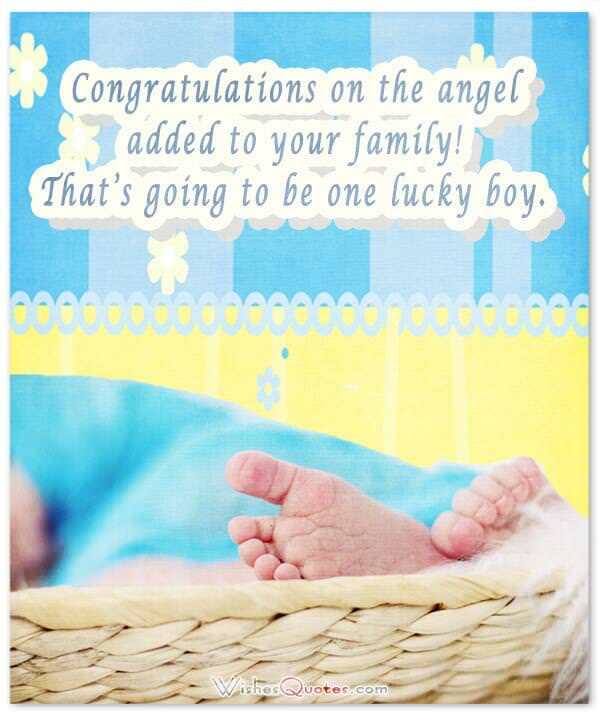 The best way to show your love and make the family where the child is born happy is to send some fantastic new baby boy wishes. These cute congratulation messages are perfect examples of what to say to the new parents who just welcomed their newborn baby boy. There is nothing more beautiful than the birth of a child. 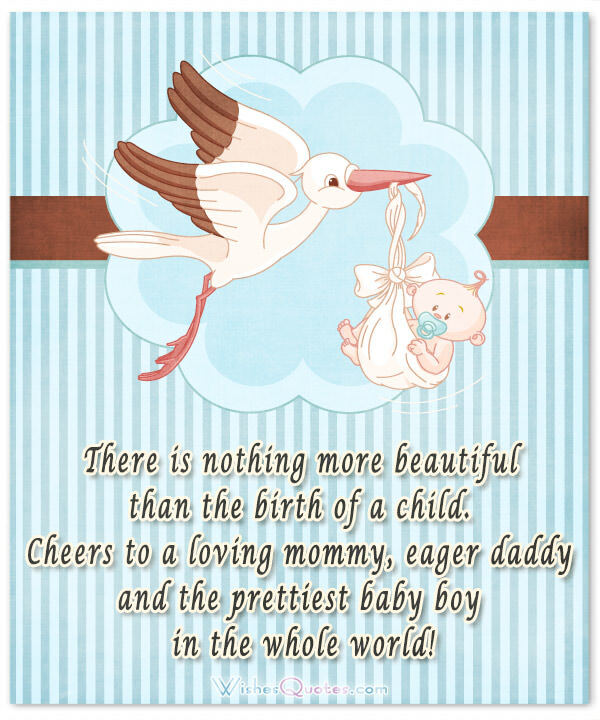 Cheers to a loving mommy, eager daddy and the prettiest baby boy in the whole world! Congratulation for the birth of your son. May your heart swell with joy every time he smiles at you or reaches for your finger with his beautiful tiny hand! You’ve got future filled with many surprises. Part of it is because of the bundle of joy that you are holding close to your heart. Sending loads of wishes to the little prince born among us and that has made us all overjoyed. If the sun shines for a thousand years, it could never outshine the warmth and ecstatic joy I feel as I congratulate you for the birth of your son. The arrival of your new baby is the just the start of many good things. I would make a list for you, but part of the fun is discovering the little surprises that baby boy has in store for you. I hereby congratulate the proud parents of the new born prince and hope the best future for him. Congratulations for the newest member of your family! I hope this boy brings you more joy than you have ever imagine. Can’t wait to pinch its cute little baby cheeks when I see it! Congratulations! As you watch your newborn son resting in your lap, may joy, peace, happiness and tranquility be your constant companion. Congratulation, may your family be blessed! I can only imagine the happiness you must be feeling right now! I’m pretty sure, knowing you both, that you will be great parents, and that when that baby smiles, that moment will be the pinnacle of your day. Congratulations! Nine months have whizzed by, and today, you welcome a prince into your life and home. I share in your joy, and wish you and your family joy and happiness as you celebrate this wonderful addition to your family. Poets talk of the joy of holding a newborn baby in your arms. I am sure the joy they talk of is nothing compared to the joy you are feeling as you hold your new baby boy in your arms. May this joy be an ever-present force in your life! I am certain that you already know what parenthood will mean for you two. So, I wish to congratulate you and to ask you a very simple question. Are you up for an adventure? Raising a boy is always a tough challenge. Amongst many other things, they can be quite noisy and troublesome, so forget your peace and quiet for a very long time. But, when you see your little boy grow on to become a strong and independent man, then all of your worries will be gone. Congratulations! Every story deserves a charming prince to save the day. So I am very happy to see yours got the prince it deserves. Congratulations! No matter how cold someone’s heart is, it can’t-do anything else than melt at the sight of your beautiful little man, I truly can’t wait to see him all grown up ready to conquer the world. Congratulations! After 9 really tough months, the time has finally come! Get ready for your beautiful house to be filled with ninjas, dinosaurs, and knights! But at least it’ll be living in a fantasy world, for your little magical boy. Congratulations! The challenges you will now face, are not only limited to the normal struggles of raising a child but as this little man grows, you will have to constantly run around chasing him, since little boys have a constant need of exploring what’s around them. But that’s a good thing! Since he will be ready to conquer the world from such a young age! Congratulations! I’d like to wish for this fine young boy you now have as a part of your family, to grow up and become the man of his dreams. May luck be on his side. Congratulations! I really want to ask you. How does it feel to have the future man of the year crying in your arms? Because with parents like you, he is definitely becoming someone great! Congratulations! Let the God shower all His power upon the little baby boy so that he can make all his near and dear ones feel proud of him. New babies herald new beginnings. May you find love, happiness and lots of laughter as you step into this next stage of your life. Kisses for your new baby boy. 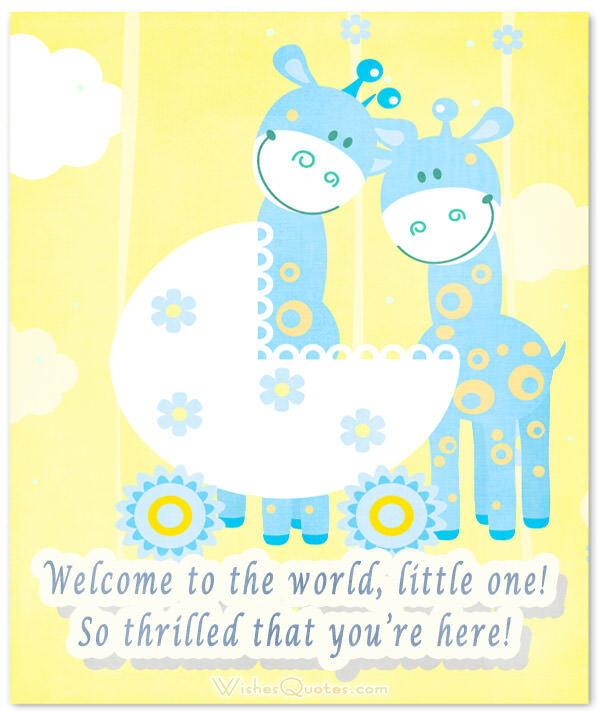 Congratulations on the arrival of your new baby boy! May your son fill your life with joy and love! Congratulations on the angel added to your family! That’s going to be one lucky boy. Goodbye tummy. Hello yummy mommy! Hello Baby Boy. Looking forward to our first playdate. It time to rejoice and get mad with happiness as the hero of the future was born today. So happy for you two! 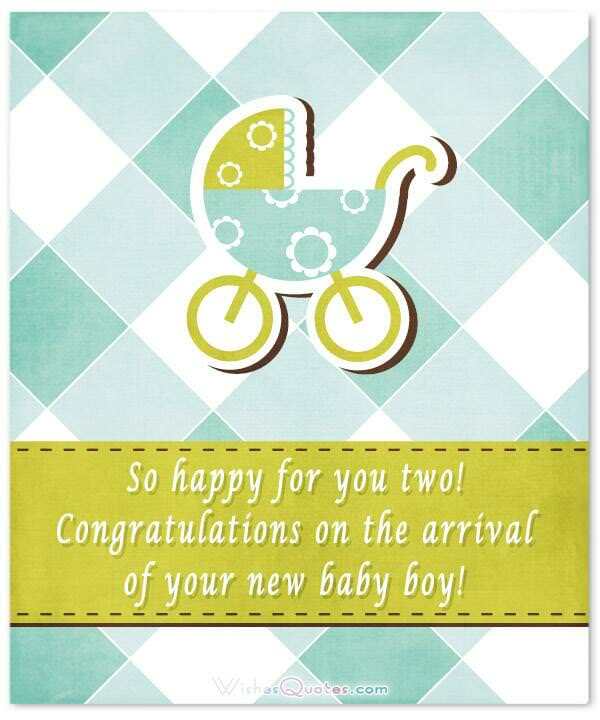 Congratulations on the arrival of your new baby boy! If joy and happiness were commodities, I would send you “ferry loads” as you celebrate the birth of your son. I wish you well and hope that every time you listen to his laughter, your family’s happiness will multiply tenfold. A newborn son is like the sun after a long period of rain: a sign of a new chapter. I take this chance to wish you good tidings as you embark on this new and exciting chapter of your life. Congratulation on your little bundle of joy! Now that your precious son is born, you need to brush up on stories about little monsters and super heroes. I pray to the Almighty to shower all the blessings upon the little prince born in this world. Prayers and good wishes for you and your family on the birth of your baby boy. Hope this day will be memorable to all the ones who are waiting for the little prince to grow up quickly and have a tremendous future. Sending oceans of love for the new born baby boy who is the little hero. 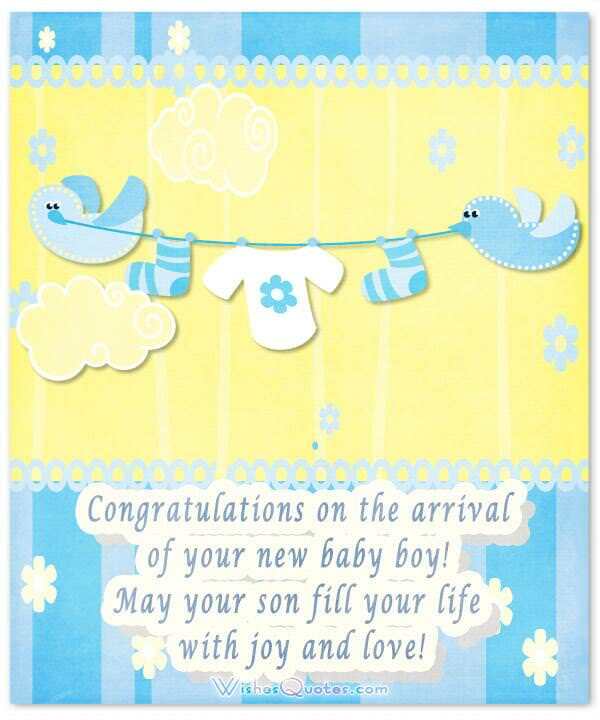 Wish the best of the best future for the new born baby boy. Sending tons of love to the little prince and congratulations to the new parents. I wish this little new born baby boy to have wonderful dreams and may the Almighty always be with him to fulfill his dreams on the walk of his life. 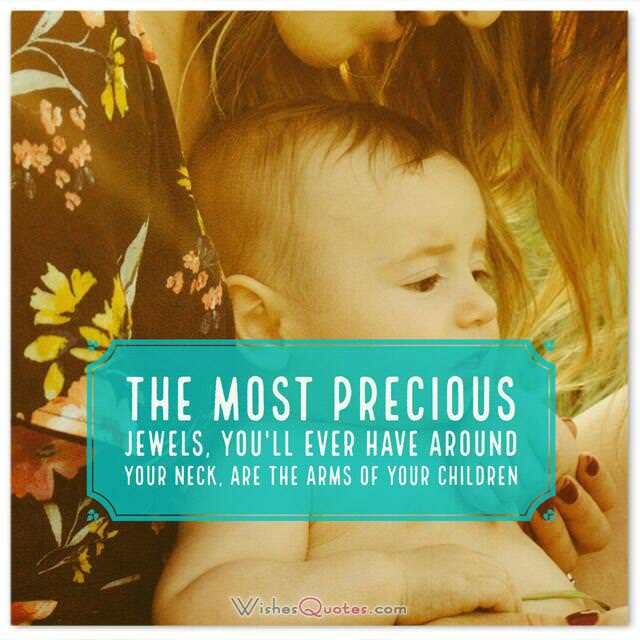 The most precious jewels, you’ll ever have around your neck, are the arms of your children.